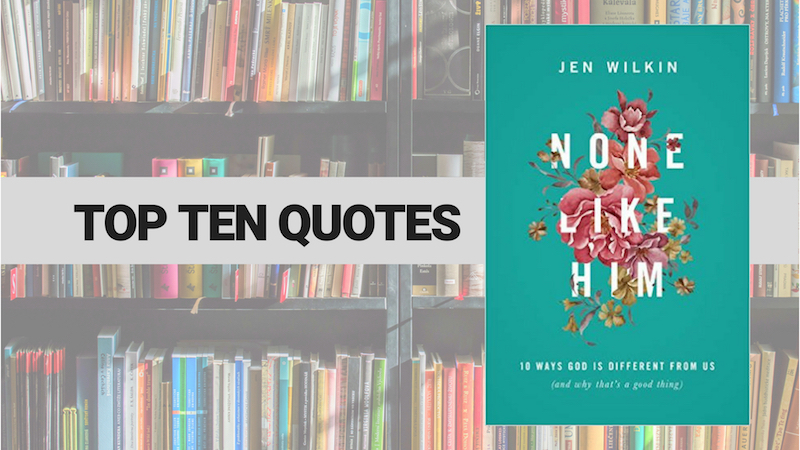 I just wrapped up None Like Him: 10 Ways God is Different from Us (And Why That’s a Good Thing) by Jen Wilkin. And…wow. What a refreshing, focused, renewed look at the character of God. Jen delivers the goods chapter after chapter, inviting the reader to drink deeply, viewing God as a loving Father who is also infinite, eternal, omniscient, and sovereign. You would think if she listed ten attributes, I’d give you one quote from each. Not today, campers. I’m gonna zig when you expect me to zag. Boom. The author of Hebrews takes care to distinguish between the fear of God’s consuming wrath and the fear of God’s holiness. Both may cause us to tremble, but only the second causes us to worship and repent. Because of Christ, you and I do not come cowering to fearsome, thundering Mount Sinai; instead we come expectantly to glorious, approachable Mount Zion. Our limits teach us the fear of the Lord…When I reach the limit of my reason, I worship the One whose reason is beyond searching out. [on Nebuchadnezzar] God graciously restores our sanity and raises us up to serve…By all means, employ the gifts he has entrusted to you to create a home for your family, a career path, a ministry, but know that you do so as a steward. Be quick to confess to him your tendency to trust your own resources rather than acknowledge him as your provider. Be quick to confess your needs to him and ask him to meet them. Busyness believes that the time God has given is not adequate. We must redeem the present by leaving time to observe the practice of stillness and the precept of Sabbath, taking on the trusting posture of one who sits at the feet of her Lord. …we cannot trust our perception of God’s closeness to be accurate. God is near whether we feel him to be or not. How mindful we are of this truth will directly affect the way we live. Rather than casting all your anxieties on the Internet, which cares for no man, cast them on God, for he cares for you. The idea of God’s infinite rule is not only difficult to grasp, it is difficult to trust, unless we have first spent time considering other aspects of his nature. [Ask] “Who is being the kindest?” Preferential love of others requires crushing our desire to control them. Choose kindness over control, and watch your relationships gain health. If you had told me five years ago that I would one day write a book for Christian women that led off with a quote from Proverbs 31, I probably would have punched you in the face.